I was invited to come along to this years spirituality meets science research and development Easter weekend, and thought I would log some data to show the potential and experiences of the PandoraStar. With over 40+ people attending at the event, it was a lovely venue to explore consciousness at a light & deep level. There were lectures and experiments on EVP (Electronic Voice Phenomena), Skotography (spirit photo communication), Deep trance states, and grand circle experiments using research equipment, all with the use of an Aura camera to notice changes in mind/body/spirit, and along side the two PandoraStars. 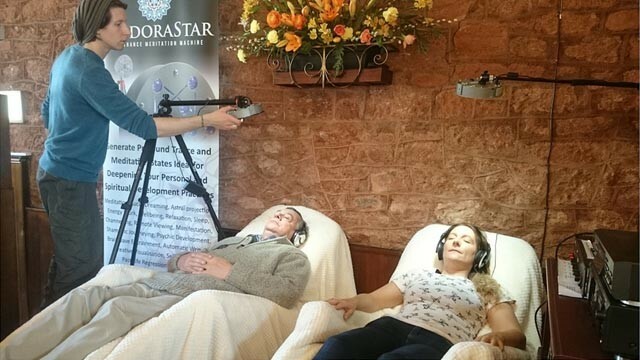 It was enjoyable to see the public going under the PandoraStars for the first time in pairs to transfer telepathic data and research deep trance states for mediumship, healing,psychic awareness and beyond.